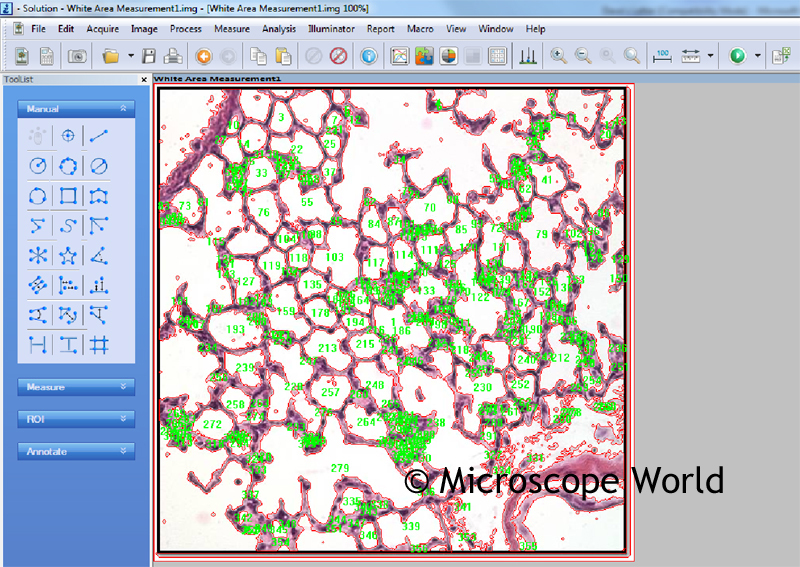 Microscope World recently had a customer from the University of Chicago who needed to measure the white area that was around and between alveoli (lung tissue) samples. By using a microscope camera with I-Solutions software, we are able to help this customer solve their problem. First, the alveoli image was captured and the color was adjusted so that cells really stood out. Using the thresh-holding feature to measure the space between the lines of tissue, data was collected and exported to excel. These are the statistics that were gathered from the image above. By using features of the I-Solutions software, the white area of the sample was easily calculated and the appropriate research was completed. If you have a similar problem you are trying to solve, please contact Microscope World.